Robert Fleischman is an American artist/singer, songwriter, producer and renowned painter. 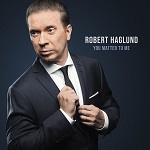 He is best known for his collaboration with Journey, Vinnie Vincent Invasion, Channel and The Sky. Fleischman has also released several solo albums, and he has written music for TV and commercials such as “That 70’s Show” and “SpongeBob SquarePants.” Fleischman has done a lot things in his long career, and in this interview, we tried to go through all of it. The past, present, and the future of Robert Fleischman. Let’s go back to the early days when you first met with Vinnie Vincent. How did the two of you connect? Robert Fleischman: I met Vinnie through Adam Mitchell, who was a songwriter, who wrote with KISS. I guess he wrote with Paul Stanley, mainly. Adam Mitchell told Vinnie about me because Vinnie was asking him about available singers in Los Angeles and Hollywood. I gave Adam my number and Vinnie called me up, and he came to my house. I opened up the door, and he is standing there with a little T-shirt on and some tennis shoes and some jeans, with a cassette in his hand. He came in, we had some tea, and then we sat in my living room. I popped the cassette in and jacked up the volume, and I heard, “Boys Are Gonna Rock,” “Substitute,” and “Shoot U Full of Love.” I heard it and being a songwriter, in the sense of I’m very particular about songs, I just thought what he did was like the edgiest and melodic, and amazing guitar playing. So here is this guy, he’s like Eddie Van Halen. 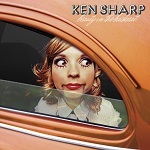 Plus, he can write songs like Lennon–McCartney, kind of anything. You got to understand that Vinnie can play anything. He can play country, classical, flamingo; he can play anything. He is just a virtuoso. So, having somebody like that in a team is great, because it inspires me and it inspires him. So, it’s a good exchange of energy going back and forth, like a good tennis match. So, it was great. Then, later on, we recorded and stuff, and then he called me up and said, he got an offer to go with KISS. Did Vinnie do auditions to find the right guys in the band? Robert Fleischman: I never auditioned, and I think that Dana was kind of there already. He wasn’t my favorite person in the world, but I’ll tell you the truth. I went to see somebody playing. Vince Neil was playing, and Dana now plays with Vince Neil. So, a friend of mine who knows Dana told him that I was there and so Dana goes, “Oh! I want to see Robert.” So, I went to see him, and at first, I was really reluctant. I saw him, and I talked to him. Now we have kids and everything, and I felt like he was a different person. The kids can change a demon into a flower. So, I kind of gathered all that and I said, “Okay, fine, everything is fine.” So, it was good to see somebody go through an actual change and see the difference. Robert Fleischman: I loved Bobby. I still see Bobby every time he comes into town with Lita Ford. In the past couple of years, I’ve seen him like four or five times. I see him a lot. He texted me last night, and we talked. I think he’s the nicest guy in the whole world. I remember when Vinnie and I and Dana were around, we were auditioning drummers and here comes Bobby. Bobby had driven from like Arizona or something, and he’d almost run out of gas, and he’d just kind of like floated into the driveway. He comes in, opens up his van, and he just starts setting up his drums. He’s like, “I’m just testing them out and everything.” I’m just going, “Vinnie, this is the guy” and he’s going “Okay.” So, Bobby is playing. He’s ambidextrous, like going all over the place and Vinnie is going, “Let me hear you do this, let me hear you do that.” He’s like going through the menu. I said, “Vinnie, don’t put him through this anymore. He’s the guy”. So, he was the guy. How familiar are you with the stuff what Vinnie released in the ‘90s with your vocals? When did you record those demos? Robert: I don’t remember the year. But it was in the ’80s, in the late ’80s, I think. I don’t know what the date is on those things. I thought they were demos and years later I saw that he released it. I don’t know if it was "Guitars From Hell"or something else ("Guitarmageddon"), but I think that material has been repackaged and renamed all over. I don’t keep up with it at all. It was something I did and I just kind of walked away. He took those demos, and he re-released them, and I never knew about it. He never asked me. 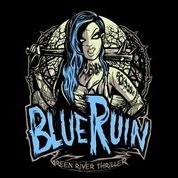 Your current drummer Andre LaBelle also played on those demos? Robert: Yeah. He did play, that’s how I met Andre. If you listen to the stuff he released later on, like "Euphoria" or "The EP", it sounds that there’s a drum machine used on those albums. 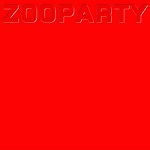 Even the album credit says it’s “V-Meister” on drums or something like that. So, do you know what happened to those original drum tracks? A new tribute album dedicated to legendary guitarist Gary Moore will be released this fall. Due on October 26 via earMUSIC, "Moore Blues for Gary - A Tribute To Gary Moore" is the brainchild of Bob Daisley, who had played bass with Gary since the early eighties. The sky was crying when Moore passed away on February 6, 2011. From THIN LIZZY to COLOSSEUM II, together with his solo hits "Parisienne Walkways" and "Out In The Fields", Gary influenced a whole generation of guitar players and guitar playing. Daisley is known for suggesting to Gary that he should make a blues album — the rest is history. "Still Got The Blues" was an immense hit, followed by a series of classic modern blues albums. Bob, also known for his contributions to RAINBOW and OZZY OSBOURNE, was the driving force behind "Moore Blues For Gary". Gary's friends are here — his rocking keyboard / guitar / vocal sidekick Neil Carter sings "Empty Rooms", which he co-wrote with Gary. Don Airey (DEEP PURPLE, RAINBOW) and Glenn Hughes (DEEP PURPLE) had joined forces with Gary on numerous occasions, together with Eric Singer (KISS) and Darrin Mooney (PRIMAL SCREAM). Brush Shiels, the leader of Gary's first professional band SKID ROW, also makes an appearance. Gary's sons Jack and Gus are also involved, playing guitar and singing on "This One's For You", showing that the "Blood Of Emeralds" still runs their veins. 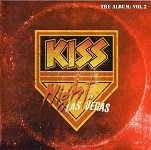 WORLD PREMIER VIDEO of I Still Love You from KISS Night in Las Vegas. 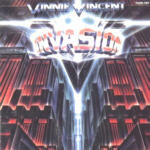 In 1981 Vinnie Vincent (Vinnie Cusano) was involved with CARMINE APPICE self titled solo album. Vinnie co-wrote the song "Drum City Rocker". 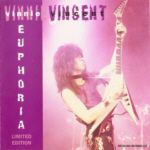 Prior this release Vinnie was in his live band CARMINE AND THE ROCKERS. 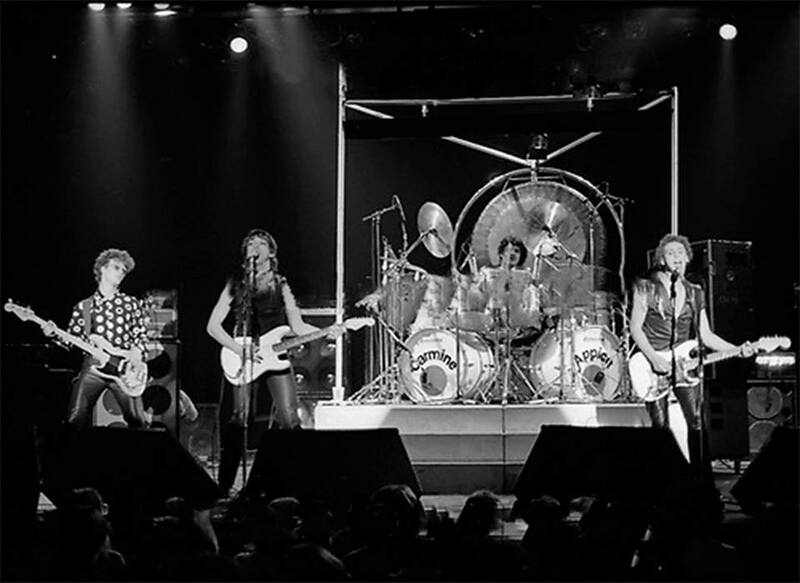 Check out some live photo's taken in Santa Monica (California), May 23, 1980 clicking here. Finally, it took some time, but here's my review of two Gene Simmons Band concerts (Tilburg, The Netherlands July 19 and Oberhausen, Germany July 20) I attended, as well as two Gene Simmons The Vault Experiences (Amsterdam, The Netherlands July 22, and Frankfurt, Germany July 24). Because I mentioned Anna Dalva (Bullfrog Bheer 1967 -1968) and Gene Simmons is aware of this website The Amsterdam Vault Experience turned out to be very special for me personally !! From one moment to another Gene Simmons picked a guitar and played us “Movin' On”, explaining that the chords came from Anna Dalva. After Frankfurt, and a few weeks later, it’s cool to realize they’re back in contact with each other after 50 years !!! Blogger Michael Cavacini recently interviewed Ace Frehley, topics includes his recently released albums, recording and touring with Gene Simmons (incl. 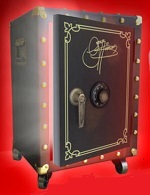 The Vault). interesting to read Ace Frehley is pretty direct with some of his answers. 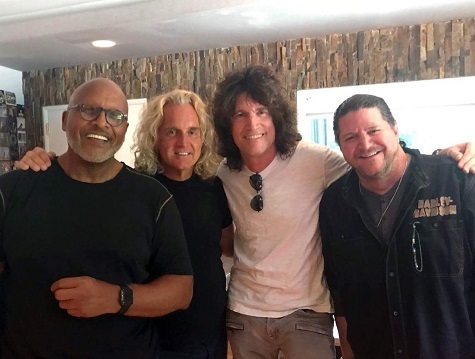 In the studio cutting with Steve Ferrone (Tom Petty and the Heartbreakers) & Jason Scheff (Chicago) with the great Scott Frankfurt at the helm. 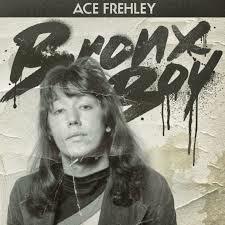 Ace Frehley has released a new song today called "Rockin' With The Boys" (iTunes). This is the second song Frehley has made available from his forthcoming all-new "Spaceman" album, due October 19 via Entertainment One (eOne). Frehley previously released the track "Bronx Boy" in April. 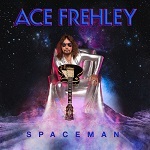 "Spaceman", Frehley's eighth solo LP, features nine new original tracks, including a cover of Eddie Money's "I Wanna Go Back", a ripping power pop makeover of the original. "No need to worry, I'll be home soon, 'cause I'm rockin' with the boys," Frehley sings on "Rockin' With the Boys", which tells the tales of life on the road. Ace says he wrote the original version of the song back in KISS's heyday in the '70s. Both "Rockin With The Boys" and "Bronx Boys" are available on all streaming platforms today, and are iTunes instant-grat tracks for fans who preorder the album. In addition to Ace's distinctive guitar sound on each track, Ace played bass on all of the songs on "Spaceman" except for two. 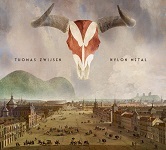 The listener might recognize the mighty dinosaur growl of a bass tone belonging to Gene Simmons on the album opener, "Without You I'm Nothing", which Gene also co-wrote, and "Your Wish Is My Command". Both songs were recorded at Frehley's home studio in Rancho Santa Fe, California. 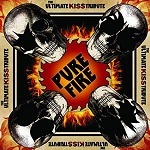 Ace's reconnection with Simmons and fellow KISS vocalist-guitarist Paul Stanley (who joined Ace on a cover of FREE's "Fire And Water" for 2016's covers LP "Origins, Vol. 1") might be chalked up to the fact that Frehley has been sober for more than a decade (he celebrates 12 years of sobriety in September). Ace's clean living no doubt has a lot to do with his productive streak, which began with the release of his top 20 "Anomaly" album in 2009. "Spaceman" (a title suggested by Simmons himself) serves as the first collection of all new Frehley-penned material since 2014's "Space Invader", which debuted at No. 9 on the Top 200 chart. 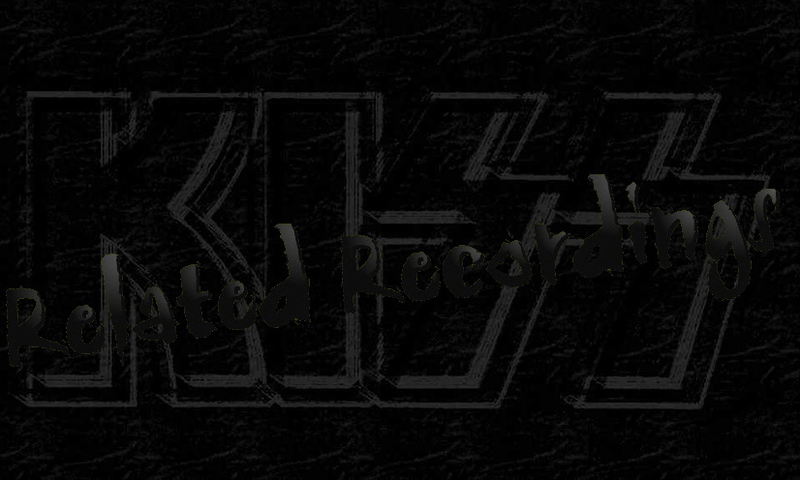 The LP scored the highest=charting position of any former or current KISS bandmember ever and marked Frehley's first return to the Top 10 since KISS's 1998 "Psycho Circus" reunion album. 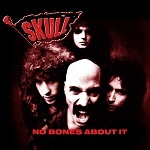 UK label Cherry Red Records will release expanded 2CD reissues of Bob Kulick's SKULL 1991 album “No Bones About It”, and MURDER'S ROW self titled 1996 album. Both albums features co-writes by Bruce Kulick, as well as a guest appearance on the SKULL song "This Side Of Paradise". Together with both releases another 2CD expanded release of SKULL is planned which represents a “what could have been” second SKULL album, entitled "SKULL II - Now More Than Ever". Release date : August 24, 2018.
purchase SKULL No Bones About It, 2 CD EXPANDED EDITION at Cherry Red Records > clicking here. This 37 track, 2CD set represents a “what could have been” second Skull album. It includes 14 previously unreleased original studio tracks making up an entire “lost” album’s worth of Skull material, plus an abundance of demos dating back to the earliest stages of the band’s recording history. 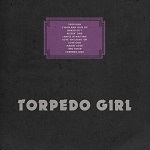 What can be considered one of the strongest collections of “lost” songs unearthed in recent times. 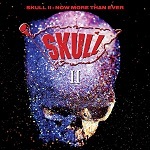 purchase SKULL II - Now More Than Ever, 2 CD EXPANDED EDITION at Cherry Red Records > clicking here. Release date : September 21, 2018. With the short-lived “Murderer’s Row”, Bob Kulick was joined by Jimmy Waldo on keyboards, who has had as varied a career as Kulick, having played with Alcatrazz, BLACKTHORNE (alongside Kulick), Graham Bonnet Band, NEW ENGLAND and Quiet Riot. The band were fronted by David Glen Eisley, who had previously sung lead vocals for the bands Sorcery (1980-1983), Giuffria (1983–1988) and Dirty White Boy (1988–1991) before joining Bob and Jimmy in Murderer’s Row. Drummer Jay Schellenbaum had played with Asia, Circa and Hurricane, with the line-up completed by bassist Chuck Wright. Produced by Bob Kulick, Jimmy Waldo and David Glen Eisley, and engineered by Pat Regan, the self-titled “Murderer’s Row” CD now includes a second disc of unreleased bonus tracks of rough mixes of the entire album. purchase MURDERER'S ROW : Murderer's Row, 2 CD EXPANDED EDITION at Cherry Red Records > clicking here. 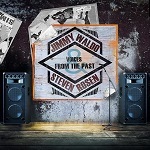 'Voices From The Past' is a very special double CD voyage into the heyday of the Los Angeles 80s rock scene, with your hosts Jimmy Waldo (ex WARRIOR) & Steven Rosen. A handful of the songs here were things I wrote with other people and which Jimmy engineered. Jimmy had by the time we met, already played keyboards in New England and Alcatrazz and would go on to become a member in BLACKTHORNE, MURDERER'S ROW, Quiet Riot and ultimately Graham Bonnet’s band. The double CD will be released via MRR on September 28, 2018. 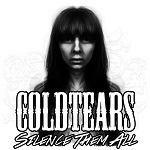 Swedish Metal band COLDTEARS have released a digital single entitled "Silence Them All", which song "Miracle" features Bruce Kulick on lead guitar. COLDTEARS "Silence Them All" is available at iTunes and Spotify.